The use of mobile internet devices (MIDs), smartphones, and proprietary software applications (also known as "apps" in short) can improve communication among medical caregivers. , Wani et al. have highlighted the efficacy of communication using WhatsApp in plastic surgery. We would like to elaborate upon a wider scope of usage of these MIDs in improving health care as well as medical education. There has been an accumulative growth in information technology in the last few decades. The utilization of these mobile technologies has further transformed health care, communications, commerce, education, and entertainment, among other fields. Newer technologies have the potential to be adapted for improvement in health care and medical education for medical sciences in general. Due to this reason, mobile devices are increasingly being used since the past few years, reflecting the growth in technology that has enhanced access to information. Thus, the future of health care, medicine, and medical education depends upon technological innovations as well as the capability of future generations of physicians, medical teachers, and even medical students to adapt to newer technologies. Terminologies like smartphones, MIDs, personal digital assistants (PDAs), apps, tablets, mobile operating systems (mobile OSs), cloud computing, etc. have become fairly common parlance among the new generations of technology-driven health caregivers. A brief introduction to the terminology in the context of mobile technology is essential in improving the understanding. Mobile device is also known as a handheld device, handheld computer, or simply handheld. It is a small, handheld computing device, having a display screen with touch input and sometimes a miniature keyboard. The emergence of technological sophistication has brought about extremely lightweight devices. A MID is a multimedia-capable mobile device providing wireless Internet access. It allows two-way communication with real-time sharing of data and location-based services. A PDA is also known as a palmtop computer or a personal data assistant. It is a mobile device that functions mainly as a personal information manager. With the growing sophistication of mobile devices, these are becoming obsolete. Mobile phone is also known as a cellular phone, cell phone, hand phone, or simply a mobile. It is a device that can be used to make and receive telephone calls over a radio link while moving around a wide geographical area. In addition to telephony, modern mobile phones support services such as text messaging/short message service (SMS), multimedia messaging service (MMS), e-mail, Internet access, short-range wireless communications (e.g., infrared, Bluetooth) apart from business applications, gaming, and photography. Smartphones are mobile phones built on a mobile OS, with more advanced computational capability and connectivity. The first smartphones combined the functions of a PDA with a mobile phone. Newer models perform as portable media players, low-end compact digital cameras, pocket video cameras, and Global Positioning System (GPS) navigation units combined to form one multi-use device. Further, modern smartphones include high-resolution touchscreens and web browsers that display standard web pages as well as mobile-optimized sites. High-speed Internet data access is provided by either Wi-Fi or mobile broadband. A tablet computer, also known as a tablet, is a one-piece mobile computer. These devices have a touchscreen, which can be controlled with finger (or stylus) and supported by the use of one or more physical context-sensitive buttons and are guided by the input from one or more accelerometers. Accelerometers refer to a mobile component that can measure the tilting motion and orientation of the mobile device. These also come equipped with touch-sensitive hideable onscreen keyboards. They are available in a variety of sizes like 7 in and 10 in, which refer to the diagonal screen size. Mobile OS, also known as mobile operating system, is an OS software that operates a smartphone, tablet, PDA, or other digital mobile devices. Modern mobile OSs are responsible for the multifaceted performance capabilities of smartphones. At present, multiple OSs for mobile and handheld devices are available [Table 1]. These are application software, used in handheld computing devices having an OS. They are programs developed to run on the device for a specific purpose. These can be either native apps or web apps. The native apps depend on the OS and can be used offline. The web apps are those applications that are present on the web and can be accessed through the mobile Internet browser (e.g., mobile website versions of a standard website). The web apps need network access and work only when one is online. With the improvement in mobile software technology, "hybrid apps" are becoming more common. The hybrid apps are advanced versions of web apps that are installed on the MID and have the capabilities to use the native apps of the device. G stands for generations of wireless telecom connectivity. Accordingly, there are 1G, 2G, 3G, and 4G technologies, 4G being the most advanced technology in general usage at present. Research for the development of 5G technology is being carried out worldwide. Cloud computing is the use of hardware and software resources, which are available in a remote location and accessible over the Internet. Can transform the mobile phone into a medical device with the addition of an attachment [e.g., AliveCor's AliveECG app, which can convert the mobile phone into an electrocardiogram (ECG) monitor]. Few studies have been carried out for assessing the diagnostic ability of these software and devices. They have shown excellent correlation between the smartphone ECG software recording versus the standard 12-lead ECG recordings. Websites (for example, www.theappbuilder.com) for the creation of web apps are available where patient-specific applications can be produced for guidance of treatment schedules, physiotherapy regimens following reconstructive surgery, or speech therapy regimens for cleft palate patients. These applications can be designed by the physicians themselves, based on their practice and requirements. 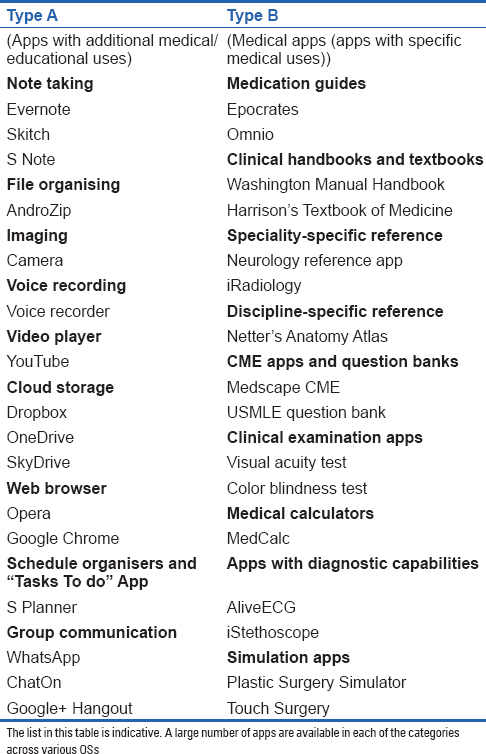 We have suggested a classification of medical apps useful in medical education according to their utility [Table 2]. a. IM: IM is the collection and management of information from one or more sources and the distribution of that information to relevant audiences. IM consists of organizing, retrieving, acquiring, securing, and maintaining information. Present day mobile devices perform these activities extremely well. Storage and organization: MIDs come equipped with an inbuilt or expandable memory, which is essential for the storage of information. Consequently, medical textbooks can be stored in the form of e-books and portable document formats (PDFs). A large number of books can be stored virtually, depending on the storage capacity of the device and can be retrieved later. The availability of cloud computing and storage applications (e.g., Dropbox) has further facilitated information storage and retrieval. Internet-based resources like online repository of video clips (e.g., YouTube) provide a platform for information storage and instructional resources. These can complement traditional teaching and also act as sources of reliable online medical information for patients. Retrieval of information: Other means of retrieval and access of information is in the form of online textbooks, apps-based text [Figure 2]a and reference books, medical podcasts, medical calculators, and online lectures. In addition, these can be used to access online journals and get medical news online. Software archives are packed with multimedia-rich educational applications, covering virtually every biomedical subject. Certified health care providers can have access to online continuing medical education (CME) to revalidate their credentials through these mobile devices. Mobile devices, including smartphones, can serve highly customized educational and scientific content through Rich Site Summary (RSS) feeds and social media. Studies have showed that smartphones facilitate student learning by providing immediate access to key facts, allowing learning in the context (e.g., learning clinical diagnosis and treatment protocols in the wards by using applications like Medscape) and by repetition, supplementing other ways of learning, and making optimal use of the available time. The advantages of mobile devices-based medical education were identified as portability, flexibility, access to multimedia, and the ability to look up information quickly. b. Communication: True to their primary purpose, these devices help in communication between peers, teachers, and other members of the medical education team about patient care using telephone, text messages, e-mail, multimedia messages, and teleconferencing. SMS-based schedule reminders have been found to be useful in increasing student participation in educational activities. Text-to-speech, speech-to-text, and speech-to-speech translations have become a reality. How these could be optimally used for improving cognitive learning among medical students remains to be seen. c. Time management: These can be based on the use of calendar-based apps and can help students and teachers by providing access to schedules of the medical curriculum. Superficial learning: Some researchers have demonstrated apprehension that these devices might enable learners to access information very rapidly. This may inhibit the "internalization of knowledge," which is a traditional part of medical education, leading to a potential for "superficial learning." Trusting information sources: Concerns have been shown about how learners should navigate the swarm of information available from the devices, how they should find "good applications," and how they would know if the information provided was of high quality and validated. Distraction: Mobile computing devices have been accounted for causing distraction from the normal activities of learners in classrooms and clinical settings. This could be in the form of receiving a call or text message, e-mail, or access to social networking sites on the Internet. Concerns about information privacy: Concerns have been expressed about the possible implications for privacy and confidentiality when material related to patients is stored in one's personal device. Expenses: The cost of mobile devices, paid apps, Internet usage charges, mobile data, and talktime charges all add up to the overall expenses of the learner. In addition, the creation of apps and Internet-based training modules seem to be expensive at present. At the same time, every student cannot possess devices of similar sophistication due to differences in their affordability. Blurring of personal/professional boundaries: Concerns have been expressed about mobile computing devices allowing potential intrusion of personal matters (e.g., personal texts and video messages) into professional and clinical duties. Some researchers have suggested that synchronous sharing may not be possible as a result of unreliable, unstable, or unavailable mobile access. , There are hardware-based concerns like battery life, which would limit their uses. Considering these disadvantages and perceived benefits, researchers have suggested that mobile technology be used only as a complimentary tool, in addition to the primary mode of education. The advantages of the use of mobile technology in health care and medical education include rapid decision-making, increased accessibility to data, improved clinical knowledge and efficiency, and an overall improved productivity. With the increase in popularity, number, and applications of mobile devices and apps in health care, the United States Food and Drug Administration (USFDA) has released guidelines regulating the usage of a number of these mobile medical apps. Similar guidelines need to be enforced in all countries to ensure the proper usage of apps in health care and medical education. The field of mobile technology in health-care services and medical education is quite new and throws open ample opportunities for researchers to conduct further studies. These could be related to other aspects of the use of these devices, for example, the results of early or late adoption of the devices by learners, the use of specific applications in specific medical specialties like plastic and reconstructive surgeries, and the effects of the devices on patterns of communication and information-sharing among health care providers. Studies need to be carried out to assess the utility of mobile devices in other domains of education, i.e., affective and psychomotor domains. Cost-benefit analysis and comparisons with the existing health management systems or teaching-learning methodologies as well as well designed randomized controlled trials to demonstrate the efficacy of these newer technologies are needed to ensure their acceptance as a mainstream support in medical education and health care. High quality, multicentered, and controlled trials regarding the use of mobile devices in medicine, especially in developing and resource-poor nations need to be carried out. Innovative and technologically-inclined physicians, epidemiologists, and reconstructive surgeons are particularly well placed to utilize the existing mobile software applications and also to create applications that could address public health issues affecting the population like cutaneous malignancies, tuberculosis, clefts, burns, acute wounds, chronic ulcers, and congenital and acquired hand deformities. Educators in medicine, dermatology, public health as well as the practicing physicians and surgeons need to embrace this new technology, study its further adoption, and assist in the responsible integration of these devices into the art and practice of medicine. Wani SA, Rabah SM, AlFadil S, Dewanjee N, Najmi Y. Efficacy of communication amongst staff members at plastic and reconstructive surgery section using smartphone and mobile WhatsApp. Indian J Plast Surg 2013;46:502-5. Jagannathan M. Efficacy of communication amongst staff members at plastic and reconstructive surgery section using smartphone and mobile Whats App. Indian J Plast Surg 2013;46:506-7. Kim HS, Hwang Y, Lee JH, Oh HY, Kim YJ, Kwon HY, et al. Future prospects of health management systems using cellular phones. Telemed J E Health 2014;20:544-51. Muhlestein JB, Le V, Albert D, Moreno FL, Anderson JL, Yanowitz F, et al. Smartphone ECG for evaluation of STEMI: Results of the ST LEUIS Pilot Study. J Electrocardiol 2015;48:249-59. O′Neill KM, Holmer H, Greenberg SL, Meara JG. 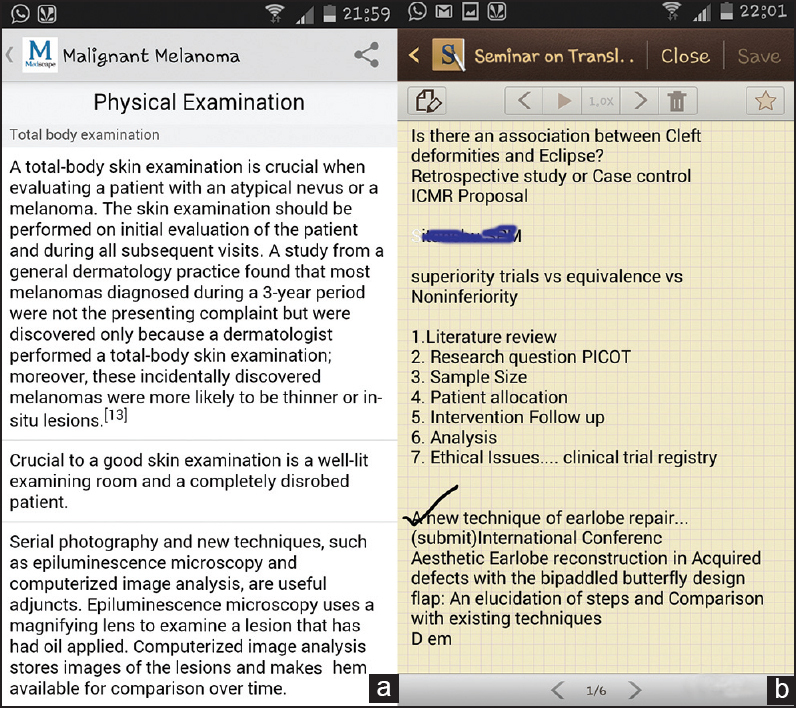 Applying surgical apps: Smartphone and tablet apps prove useful in clinical practice. Bull Am Coll Surg 2013;98:10-8. Zvornicanin E, Zvornicanin J, Hadziefendic B. The use of smart phones in ophthalmology. Acta Inform Med 2014;22:206-9. Zurita G, Nussbaum M. A conceptual framework based on activity theory for mobile CSCL. Br J Educ Technol 2007;38:211-35. Motiwalla LF. Mobile learning: A framework and evaluation. Comput Educ 2007;49:581-96. Fisher M, Baird DE. Making mLearning work: Utilizing mobile technology for active exploration, collaboration, assessment, and reflection in higher education. Journal of Educational Technology Systems 2006;35:3-30. Baumgart DC. Smartphones in clinical practice, medical education, and research. Arch Intern Med 2011;171:1294-6. Wallace S, Clark M, White J. ′It′s on my iPhone′: Attitudes to the use of mobile computing devices in medical education, a mixed-methods study. BMJ Open 2012;2. pii: e001099. Wang Y. Development and validation of a mobile computer anxiety scale. Br J Educ Technol 2007;38:990-1009. Goh T, Kinshuk. Getting ready for mobile learning--Adaptation perspective. J Educ Multimed Hypermedia 2006;15:175-98. Mobile Medical Applications. FDA. Available from: http://www.fda.gov/medicaldevices/productsandmedicalprocedures/connectedhealth/mobilemedicalapplications/default.htm. [Last accessed on 2015 Mar 09].